Enjoy snacking on popcorn? Tired of the same old, same old flavors? If so, you're going to love our guest post recipe from the great folks over at Popcorn.org. This recipe combines some really unique flavors together to give you a totally awesome snacking experience. The recipe will make approximately 2 tablespoons of seasoning mix. I think it would be the perfect snack to whip up for a Superbowl Sunday party or other sporting event. In a small bowl, blend ranch dressing mix, spice mix, garlic powder, powdered sugar and cayenne pepper. Sprinkle with vegetable oil and blend until well incorporated. 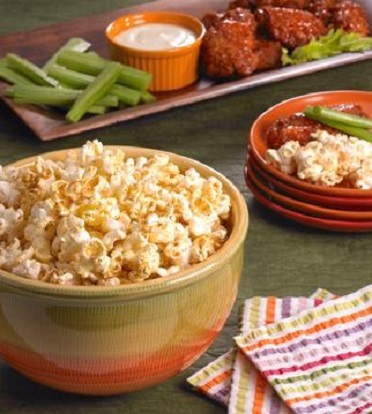 Place popcorn in a serving bowl and spray lightly with cooking spray. Sprinkle seasoning mix over popcorn to taste and toss. Store leftover seasoning mix in an airtight container for future use. I love the idea of being able to season my popcorn mixture with different seasonings. I would not have thought to use this mix before your post.